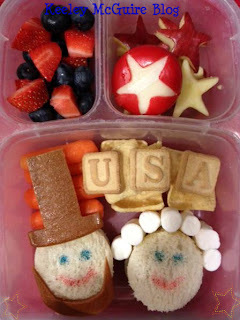 Gluten Free & Allergy Friendly: Lunch Made Easy: Happy Presidents' Day! Lunch Made Easy: Happy Presidents' Day! I chose Abe & George since both of their respective birthdays are also in February (Abe Lincoln - February 12th and George Washington - February 22nd). I made Lincoln's top hat and beard from an all natural organic strawberry fruit strip. Washington's "powdered wig" is made of mini marshmallows. Each "glued" on by small dabs of honey. The eyes and mouth were drawn on with my Betty Crocker Easy Writer pens. On top of the Plentils are alphabet cookies spelling out "U S A". Top left are red & blue - strawberries & blueberries. Top right are star cutout red delicious apples and a babybel cheese I also cut a star out of the wax on.